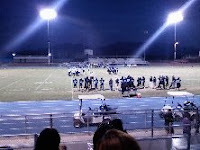 Picture of: high school football game I attended tonight. Nephew #2 (easy as I only have 3 nephews and something like 12 nieces) playing frosh football. Today I: worked fully in the background on several new projects I can't even tell you about yet; went out to said nephew's football game. Their team lost hard and he only played about 45 seconds. Interesting to note: two weeks ago an area of Tennessee I was in essentially shut down for high-school football game. 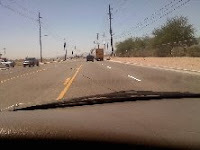 Here is AZ it was barely attended. Meh. 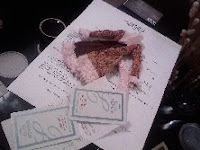 ; created new storytelling line up for event this weekend- yay for new stories to tell; happy birthday, Willow. Picture of: the strawberry birthday cake for my niece #..sheesh I can't even figure out which one. Today I: This Weekend I: had a family party for the birthday of one of my nieces, love the family parties after having been gone on huge road trips; worked with a new corporate storytelling coaching client who needed customized stories for upcoming interviews and promotions; worked on changes at storyteller.net and started to receive the hate mail that happens when you try to pull folks up to the next level; talked with other smart peers on the phone. 09.25.2008 Thursday: Home Again, Please. 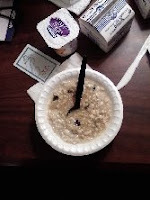 Picture of: my hotel breakfast before I started this long day. Mmmm, oatmeal. Today I: woke up earl(ier) than usual to finish a project that was bugging me in my brain; grabbed the hotel breakfast and ate it in my room; packed up my suitcases and supplies; checked out of hotel; taxi I prearranged did not come so I took the hotel shuttle to the airport and grabbed a taxi there; missed taxi meant I missed the group bus to go run up (or even amble up) the "Rocky" stairs in Philly; presented my brief workshop on the use of folktales/fables in business and corporate storytelling settings; talked with several people afterwards who might be interested in my services as a storytelling coach; had a great lunch with lots of positive conversation; attended a workshop on the use and development of telecourses; "split" a cab with another person back to the Philly airport; took a B767 plane from Philly to Charlotte- first wide-body (umm, sorta) that I had been on since I was in high-school; barely made it in time for my flight to PHX-which was a cramped, painful trip and otherwise uneventful. BOO to USAirways for the $15 baggage fee. I don't pay it 'cuz I travel so much but others try to get around it by taking everything on board causing chaos and unhappy people. 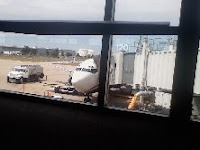 (BOO USAirways for this! ); finally got home to my lovely family at the airport and the drive home- just about 10 days straight on the road; ate some late dinner; wrote to you; crawling into bed. Whew! 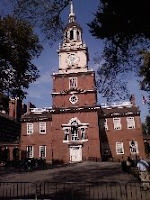 Picture of: the "Independence Hall National Park" in central-city Philadelphia, PA.
Today I: ate the hotel breakfast; took a cab to my meeting; participated in a workshop on marketing (that was all about storytelling- yikes! ); heard some good tips about platform selling; ate the great lunch this group provides; talked with several people who may want some storytelling coaching with me; headed back to hotel via taxi; ate delivery dinner; talked with a friend while I am on the east coast; prepped my presentation for Thursday; good night. 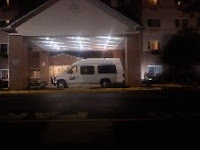 Picture of: the hotel van, as I returned back to my cell after dinner. Today I: spent most of the day in the hotel just catching up with the mountain of emails, storytelling projects, coaching projects, writings, blogs and so on that I needed to complete; posted this new blog; edited and posted this corporate storytelling video; ate dinner; came back to hotel and kept working; mostly background stuff. 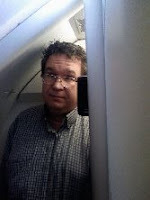 Picture of: a myspace inspired self-portrait taken in the airplane lavatory. See, nothing is too good for my readers. LOL. Today I: after catching up and doing laundry, I took a nap until my alarm went off; repacked my suitcase with my newly cleaned clothes; drove to airport with wife #1 and daughter #4; took the plane "ride" across the country from Phoenix to Philadelphia wherein I was able to take this high-class picture for you; checked into hotel; changed rooms in hotel; finished the sleep I missed last night; ate dinner at restaurant on premises; laid out my storytelling-business related work for Tuesday; goodnight. 09.21.2008 Sunday. Cramped, Missing Travel. 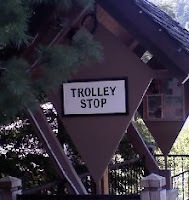 Picture of: the trolley stop right outside my hotel in Gatlinburg, TN. Today I: ate the hotel breakfast and headed down to Touristburg Gatlinburg downtown for the workshop I am taking/presenting at; talked with booking agents here at the conference- good folks; good lunch provided as part of the conference; more workshops and networking; stopped by Walmart for few things I need; went back to hotel and worked on a storytelling coaching phone call with one of my clients- I love it when folks are open to learning; talked to my family on the phone; worked on a new mailing; settled in for the night. By the way, how can you tell a resident of this area from the tourists? All the residents were watching football tonight. You have to be a Tennessee fan here or they beat you with orange sticks. LOL. 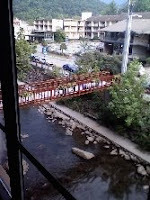 Picture of: the view from the hotel lobby in Gatlinburg, river running below, Smoky Mountains in the background. 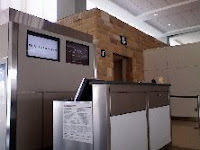 Picture of: my mini-office set up in cubicle the Charlotte airport club. Today I: left my house at 415am to start my travel day...Phoenix to Charlotte to Knoxville; grabbed the rental car and drove through the Smoky Mountains to Gatlinburg; checked into the hotel; phone meeting with sponsor for next week's event; participated in a coaching call for mastermind group I belong to; drove into town to find hotel for tomorrow, this place is a huge tourist trap. Picture of: pile of things I leave behind for staff to do while I am gone over the next few days. Today I: spoke with two clients about upcoming storytelling events- probably will be able to do one and not the other; researched new story; prepped handouts for event on Friday in Tennessee; reviewed CD-audio for a coaching client; went to lunch with wife; banged my head against my virtual virtual-server wall for the unbelievable amount of spam I am getting right now-wow; went banking and post officing; finished, finally, a huge stack of audio files that needed to be posted; went to Kinko's and Target with family; ate dinner; back to Kinko's and Best Buy for printer ink; washed clothes; finished packing; left pile of work for others to do; going now to watch "The Daily Show." Today I: slept in a bit after yesterday's long coaching and corporate storytelling day; worked on Emails to clients back in Phoenix; packed up my belongings in my hotel room; cleaned up meself and checked out of hotel; had lunch at the local "casual dining" location; gassed up the rental car; drove to airport in Austin and turned in the car; wanted to poke AVIS in the eye for this crazy "automatic" charge of $14 if you drive less than 75 miles in your rental. They charge your card (holding that money) and *then* ask you if you bought gas so they can refund the $14 to you; checked in, did the TSA shuffle and hurried-up-and-waited at the gate; got bumped up to first-class; took the 2.5 hour flight back to Phoenix; wife and daughter #4 met me there and drove on back home; worked on a problem with delivery of an audio kit; did not respond to more echo-chambering storytelling stuff; ate dinner at home and took my family out for dessert; unpacked suitcase and found large, live beetle bug in my case- musta wanted to leave Texas; calling it a night. Picture of: Pile of things on the desk of my hotel room. Included is a piece of doll clothing that apparently one of my daughters placed in my suitcase. Odd. Funny. 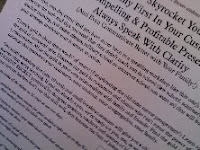 Picture of: new handout for the "Ancient Secret of Public Speaking Workshop." You can download a copy at this link. 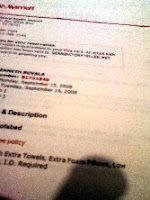 Picture of: my confirmation for my Austin, Texas hotel on Monday. Today I: worked with my new Texas client to secure payments and last minute arrangements; returned rental car after picking up my now fixed-for-now mini van; crafted and sent "letter of agreement" to client; did the post office and bank run; reviewed materials for the string of out-of-state corporate storytelling gigs I have going on; finished revision of handouts and sent the project over to Kinko's- talked to the counter guy on the phone and I know he's going to do it wrong. Sigh. We'll see. Picture of: a traffic instruction sign that was unhinged after big storm in the city tonight. Now, if you live in England or Australia, you might be able to follow these instructions. Here you can not. Today I: got a 2am text message from my Dad advising us that grandchild #11 had arrived- congrats to brother and his wife; secured final prep for gig in Austin on Monday; booked hotel and air travel for Monday; participated in multiple teleconferences for mastermind coaching groups; picked up rental car in order to drop off broken mini-van (again) to repair joint; drove across town in storm to work with coaching client on her latest storytelling presentation; talked to new daddy brother on the phone; read the guinea pig's blog and it is phabulous, Phineas. 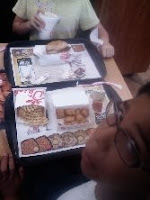 Picture of: trays at dining place tonight wherein I took six cousins and sisters, to have dinner. Today I: had a surprise phone call from a client in (Austin area) Texas who wants to hire me for Monday night- last minute opening in an event, etc. I am the *perfect* person to do what they want and I have astongishingly, the time open before I head out for nearly two weeks travelling; spoke with potential corporate storytelling client; wrote and email proposal to same client; spoke again to same client and other decision maker some more- if nothing else in this business of being a full-time storyteller, I do get to talk with very interesting people- gotta love that part; spoke with another client for to expand my role for another project later this month; went to lunch to have business meeting with staff; began new writing project; took daughters/nieces to dinner and walked home with them; heard from youngest brother and his wife who expect new/first baby tonight some time. 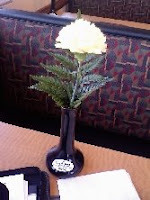 Picture of: fresh, real flower on the table of the fast food restaurant I spent time at today while writing. Picture of: the view out the front window of my van as I come back from my client's office. 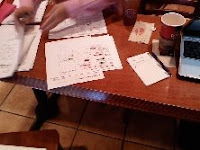 Picture of: the table where a coaching client and I were working today.